Dog Taxi Daycare & Hotel Vancouver | Dog Boarding, Training & More! We are a family-run, family-oriented team of dog lovers and experts. With over 25 years combined experience on the team, we understand dogs and their needs. We focus on Dog Behaviour and Pack Mentality, and work with you to help better understand your furry friend from a dog’s perspective. Work on consistency, commands and increasing the level of positive reinforcement. 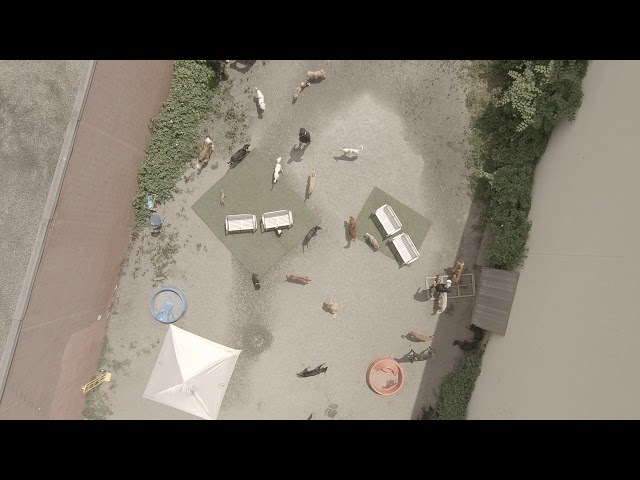 The only daycare to have a dog park in the beautiful city center of Vancouver, BC Canada. Angela is the glue that keeps things together. Without her, Dog Taxi Daycare & Hotel would not be operating at the level it does today. John hails from the UK and is our dog trainer extraordinaire. John truly is a dog whisperer and will work with you and your dog in order to get them behaving properly. Jorge is the Columbian spice that keeps Dog Taxi moving. JOIN THE DOGTAXI PACK AND HAVE A GREAT TIME! Don't have enough time to drop your canine friend off? No problem, we offer dog transportation services to and from Dog Taxi Daycare & Hotel. For two hours with all of your best furry friends.You get to run, play, learn, socialize, and get dirty. One-on-one and group training with all your favourite distractions around (Balls! Scents! Other dogs!). Mom and Dad are amazed when you get home! When the day is done, we drop you off at home for dinner with your tail wagging. If dogs could smile, you would. Want to be kept in the loop regarding all of our monthly promotions, specials & events? Sign up below to receive monthly e-mail notifications of all of the exciting stuff going on at Dog Taxi Vancouver. From monthly promotions on boarding or dog products, to news about dog training workshops & more, you will not want to miss out. I'm a very involved/neurotic owner. I constantly want to know what's going on with my dogs - and I usually like to get picture and video to back it up. I ask lots of questions and stay in frequent contact with both John and Jorge. Never at any time have I been made to feel that my "checking-in" is anything but welcome. After being out with Dog Taxi both of my dogs are exhausted - not only physically, but mentally. Nothing like structured play to wear out a fur-covered ball of energy. Since starting with Dog Taxi my younger dog has dropped his rock obsession and now happily chases his ball instead. My older dog is learning how to play and interact with a lively group of dogs - something she's never been especially good at." "I have had the good luck to come across their business through a friend of mine. I was getting really desperate since I have a Beagle Puppy which I adore, but was having problems at the doggy daycare I was leaving her at. Since day one Dog Taxi Daycare understood the characteristics of her breed and were happy to accommodate her and train her according to her temper. John, Jorge and Angela show true love for dogs and they have proven that they know lots about dogs and training. Bella (my baby girl) has improved incredibly and even my mom during her visit was surprised on the results considering that she's a 9 months old puppy. They make my sweet young girl happy and they make me happy as well! Thank you guys!!!!" "When I needed a place for my dog to stay while I went away, I searched and found John at Dog Taxi Daycare. I immediately started sending my two year old out with him twice per week to see how he fared before leaving him with a stranger. He came home tired and happy and it soon became clear that he was very attached to John. By the time I left for my trip, both John and Trinlay were very comfortable with each other and John was very familiar with his routine. When I returned, Trinlay was relaxed, happy and healthy. That was over seven years ago! I still send Trinlay out with John and his team at least twice per week because he loves it. Furthermore, I can travel with complete peace of mind knowing that Trinlay is safe and happy while I am away. As a loving dog owner, I couldn't ask for anything more." "I first saw John over six years ago at Fraser River Park and was immediately impressed with how he handled the dogs and how the dogs responded to him. My dog has been going on walks, twice a week, with Dog Taxi ever since then. He has also boarded several times. The night before he goes with John, I tell Angus he is "going with John tomorrow" and his tail starts wagging and his one year goes up (the other one is permanently up!). John and his team are professional, reliable, accommodating and pleasant. When I have been on holiday, John has sent a video of Angus playing and having fun. I know when Angus is with Dog Taxi Daycare he is being well looked after, challenged, and having a great time!" "Our little dog picked Dog Taxi Daycare himself. After spotting them at the dog beach, he ran up to them and wanted to join in the fun. When the pack moved out to play in the tide pools, our dog stared longingly after them. He was about nine months old. He had never shown so much interest in a group before. With Dog Taxi Daycare, our dog gets SO excited every morning when the van comes. Most mornings he sits on the couch, watching out the front window. When the van pulls up, he vaults off the couch and races to the door. If he's playing and can't see out the window, he can distinguish the sound of the vans from other cars. He ALWAYS loves it, and adores the owners, John and Jorge. Honestly, I'm not surprised about the negative reviews, since this service is so different from other companies. Dog Taxi Daycare does what's best for dogs. That's bound to be tougher to operate than a standard daycare or dog walking business. John, the owner, definitely strikes me as more of a dog person than a people person. I mean that entirely as a compliment. I want a dog person looking after our dog, not an ad exec. John has a lot of insight into dog psychology, and has helped us understand our dog. From what I've seen over the past year and a half, everyone at Dog Taxi Daycare loves dogs and knows how to handle them. Thanks to Dog Taxi Daycare, our dog is well socialized, fit and happy. He's a great little guy. Dogs live such a short time - our breed has only 12-15 years on this earth. We feel privileged to have him in our family. He has brought us so much joy, and we feel he deserves the best we can provide him. To us, that's Dog Taxi. We also recommended them to a friend. Our friend's dog was on meds for anxiety, and was nervous, yappy and aggressive (I hate to say that, but it's true). Dog Taxi Daycare transformed him into a calm, relaxed, friendly dog - and no more meds. I guess I'm gushing, but I believe wholeheartedly in this company." Want to get in touch with Vancouver BC's top dog daycare, hotel & boarding facility? See our contact infor below. Copyright 2018. Dog Taxi Daycare & Dog Hotel Vancouver. Website & Marketing by More Hot Leads.